Artist’s notes: The Ocala Drive-in Theatre still shows first-run movies. 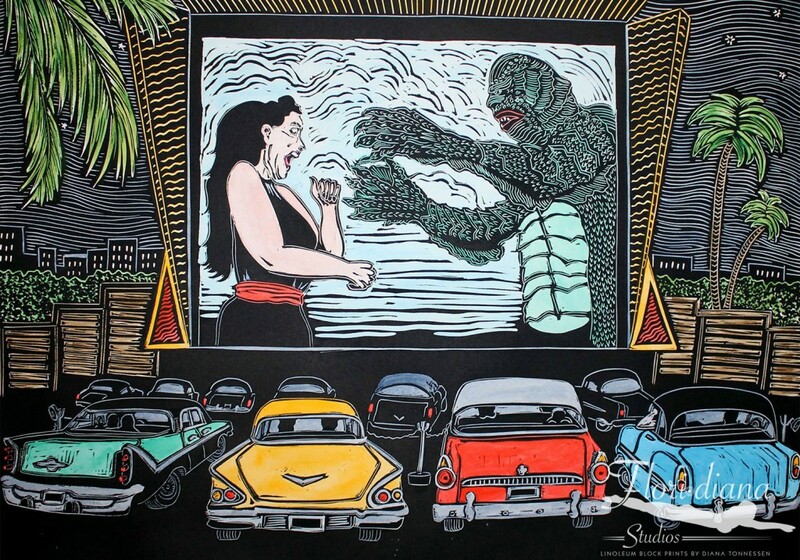 Now playing in my depiction of the drive-in theater: “The Creature from the Black Lagoon,” starring Richard Carlson and Julia Adams. Ben Chapman played the Creature (aka “Gill-man”) on land. The underwater Creature was played by Ricou Browning. Universal Pictures released the original black-and-white 3D film in 1954. The film’s underwater scenes were shot on location in Wakulla Springs outside of Tallahassee and Silver Springs in Ocala.